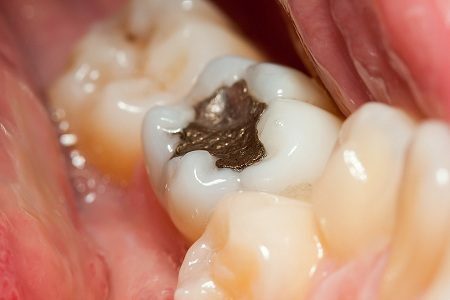 The American Dental Association, which owns patents for various formulas of mercury amalgam, says that when mercury is mixed with other metals such as silver, copper, zinc, and tin to create amalgam fillings, they are creating a durable, inexpensive, and harmless substance. The truth is that amalgam dental fillings have serious health risks, which can appear as expensive and life-threatening diseases. The evidence has continued to grow since the early 1970s that these so-called "safe" fillings should be banned in the United States, as has been done in other countries. Yet, American dentists keep on using them. Neurological symptoms in many forms are associated with mercury exposure. The consequences of mercury exposure include: MS, lupus, Alzheimer's, ALS, arthritis, Parkinson's, leukemia, Gulf War Syndrome, diabetes, seizures, and birth defects. This is actually a short list. The late Dr. Hal Huggins, DDS, indicated that 200 diseases are associated with mercury exposure. Dr. Boyd Haley’s research shows a definitive relationship between mercury exposure and the development of Alzheimer’s disease. Also on the list are numerous digestive system dysfunctions as well as infertility. Dentists are far behind the times. The EPA adopted rules to remove mercury from paint, because it was unsafe to breathe the mercury that was being released from the paint on the walls of homes. Fish that contains too much mercury cannot be sold to consumers. Yet, it is legal and still the normal practice of nearly half of dentists to keep on putting mercury amalgam in the mouths of children, pregnant women, and people who are already ill when the mercury being released from fillings is a far higher amount than that in paint or fish. It is time for a change! Well said. The element that is missing is what to do to overcome mercury toxicity. There are many chelation protocols out there. However, there is one that is far safer and more effective as it is low-dose, frequent chelation. You can find information on the Andrew Hall Cutler protocol by reading his book, Amalgam Illness, available here: http://noamalgam.com/ Or reading the basics of the protocol from a person who successfully chelated on the protocol here: http://www.livingnetwork.co.za/chelationnetwork/chelation-the-andy-cutler-protocol/ Or joining the closed Facebook group Andrew Cutler Chelation Think Tank. In all cases, please do not try to chelate until your amalgams have all been safely removed. Do not do IVs, challenge or provocation tests, use cilantro or chlorella, etc. Why? Please look at the resources for the answers as to why these things are dangerous.